"This is a timely and important book. It should be studied with care and profit inside the Nordic countries and also outside them by the broader international readership that has been established around the study of racism and 'critical race theory'. For the Nordic world, this collective, polyvocal enterprise presents a unique opportunity. It can help to break the disabling patterns of denial, delusion and defensiveness produced by the problems which racism has created in societies that strongly resent the suggestion that they could ever have been tainted by anything so foul. That reaction—which reveals that those who give voice to it do not know what racism looks like—is itself a symptom." "Sophisticated, sharp, powerful anti-racism critique, breaking longstanding myths about Nordic countries. A fascinating blend of art, autobiography, scholarship and politics offers a wealth of lenses, tools and voices to access the experience of Afro-Nordic people. This timely cross-Nordic volume is a first in its kind, a useful educational source for everyone who wants to learn about race, racism and its denial in the Nordic countries." 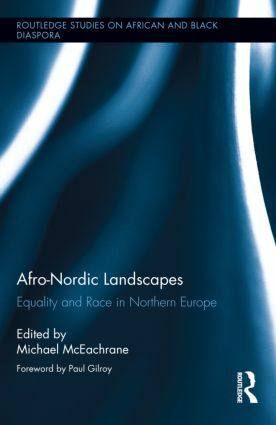 "Michael McEachrane and the contributors to Afro-Nordic Landscapes provide a rare gift: an elegant, incisive analysis of ‘invisible’ racism in and beyond Northern Europe. Through scholarship, commentary, and interviews, writers and artists decode violence and violation, making visible the resistance that frames dignity and rights. Afro-Nordic Landscapes shrinks a large world of racist-sexist denial by expanding a much smaller world of anti-racist intellectualism, one now infused with new perspectives." "The brave Afro-Nordic voices collected in this book challenge the comforting ‘exceptionalist’ myths white Scandinavians continue to tell themselves about their supposed radical difference from the other European countries’ past (and present) of white supremacy and anti-black racism. With uncompromising honesty, the book reveals the unwelcome truths behind Scandinavian white lies and collective self-delusions, in the process bringing to our political awareness a region of the international black diaspora too long neglected in the literature." "McEachrane’s book deconstructs the mythology that Nordic countries are race-neutral, and less capricious to the African Diaspora. What emerges is a region in racial tumult, perhaps less visible to the outside, but still tortured by identity. W.E.B Dubois would recognize this problem today as he did a century ago."